"FRY" redirects here. For other uses, see Fry and Fyr. "Federal Republic of Yugoslavia" redirects here. It is not to be confused with the Socialist Federal Republic of Yugoslavia. For the modern-day sovereign states, see Serbia and Montenegro. Serbia and Montenegro (Serbian: Србија и Црна Гора, СЦГ / Srbija i Crna Gora, SCG), officially the State Union of Serbia and Montenegro (Државна Заједница Србија и Црна Гора / Državna Zajednica Srbija i Crna Gora), also known as the Federal Republic of Yugoslavia from 1992 to 2003, was a country in Southeast Europe, created from the two remaining federal republics of Yugoslavia after its breakup in 1992. The republics of Serbia and Montenegro together established a federation in 1992 as the Federal Republic of Yugoslavia (FR Yugoslavia or FRY; Савезна Република Југославија / Savezna Republika Jugoslavija),. Anthem: "Хеј, Словени / "Hej, Sloveni"
^ After 2003, no city was the official capital, but legislative and executive institutions remained located in Belgrade. Podgorica served as the seat of the Supreme Court. ^ Membership as the Federal Republic of Yugoslavia. ^ De facto currencies used in Montenegro and Albanian parts of Kosovo. For the first several years of its existence, the state aspired to be recognised as the sole legal successor to Yugoslavia, but those claims were opposed by other former constituent republics. The United Nations also denied its request to take up Yugoslavia's membership. Eventually, after the overthrow of Slobodan Milošević from power as president of the federation in 2000, the country rescinded those aspirations and accepted the opinion of the Badinter Arbitration Committee about shared succession. It re-applied for UN membership on 27 October and was admitted on 1 November 2000. The FRY was initially dominated by Slobodan Milošević as President of Serbia (1989–1997) and then President of Yugoslavia (1997–2000). Milošević installed and forced the removal of several federal presidents (such as Dobrica Ćosić) and prime ministers (such as Milan Panić). However, the Montenegrin government, initially enthusiastic supporters of Milošević, started gradually distancing themselves from his policies. That culminated in regime change in 1996, when his former ally Milo Đukanović reversed his policies, became leader of Montenegro's ruling party and subsequently dismissed former Montenegrin leader Momir Bulatović, who remained loyal to the Milošević government. As Bulatović was given central positions in Belgrade from that time (as federal Prime Minister), Đukanović continued to govern Montenegro and further isolated it from Serbia. Thus from 1996 to 2006 Montenegro and Serbia were only nominally one country—governance at every feasible level was conducted locally, in Belgrade for Serbia and in Podgorica for Montenegro. As a loose union or confederacy, Serbia and Montenegro were united only in certain realms, such as defence. The two constituent republics functioned separately throughout the period of the Federal Republic, and continued to operate under separate economic policies, as well as using separate currencies (the euro was the only legal tender in Montenegro). On 21 May 2006, the Montenegrin independence referendum was held, and 55.5% of voters voted in favour of independence. The last vestiges of the former Yugoslavia, 88 years after its creation, came to an end upon Montenegro's formal declaration of independence on 3 June 2006, and Serbia's formal declaration of independence on 5 June. After the dissolution, Serbia became the legal successor of the union, while the newly independent Montenegro re-applied for membership in international organisations. 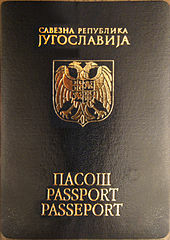 Officially, the country was known as the "Federal Republic of Yugoslavia" (Савезна Република Југославија / Savezna Republika Jugoslavija) from 1992 to 2003. The name Yugoslavia, an Anglicised transcription of Jugoslavija, is a composite word made up of jug ('yug') (with the 'j' pronounced like an English 'y') and slavija. The Slavic word jug means 'south', while slavija ('Slavia") denotes a 'land of the Slavs'. Thus, a translation of "Jugoslavija" would be 'South-Slavia' or 'Land of the South Slavs'. Even when Serbia and Montenegro was known officially as the Federal Republic of Yugoslavia or Yugoslavia for short, some nations, such as the United States, had referred to it as Serbia and Montenegro as their governments viewed its claim to Yugoslavia's successorship as illegitimate. With the collapse of Yugoslavia during the 1990s, only the republics of Serbia and Montenegro agreed to maintain the Yugoslav state, and established a new constitution for a new Yugoslavia in 1992. With the collapse of communism across Eastern Europe, the new state followed the wave of free market change. It abandoned communist symbolism: the red star was removed from the national flag, and the communist coat of arms was replaced by a white double-headed eagle with the arms of both Serbia and Montenegro within it. The new state also established the office of the president, held by a single person, initially appointed with the consent of the republics of Serbia and Montenegro until 1997 after which the president was democratically elected. With the collapse of Yugoslavia and its institutions from 1991 to 1992, the issue of unity of the two republics remaining in the collapsing federation, Serbia, Montenegro, as well as Serb-majority territories in Croatia and Bosnia that wished to remain united, became an issue. In 1991 diplomatic talks chaired by Lord Carrington with the leaders of the six republics of the collapsing federation, resulted in all the republics except for Serbia agreeing that Yugoslavia had collapsed and that each republic should become an independent state. The Serbian government was surprised and outraged by Montenegro's decision in favour of terminating Yugoslavia, as the Bulatovic government had previously been closely allied with Milosevic's government in Serbia. Yugoslavia's collapse began in 1991 when Slovenia, Croatia, and the Macedonia declared independence. On 26 December 1991, Serbia, Montenegro, and the Serb rebel-held territories in Croatia agreed that they would form a new "third Yugoslavia". Efforts were also made in 1991 to include SR Bosnia and Herzegovina within the federation, with negotiations between Miloševic, Bosnia's Serbian Democratic Party, and the Bosniak proponent of union – Bosnia's Vice-President Adil Zulfikarpašić taking place on this matter. Zulfikarpašić believed that Bosnia could benefit from a union with Serbia, Montenegro, and Krajina, thus he supported a union which would secure the unity of Serbs and Bosniaks. Miloševic continued negotiations with Zulfikarpašić to include Bosnia within a new Yugoslavia, however efforts to include the whole of Bosnia within a new Yugoslavia effectively terminated by late 1991 as Izetbegović planned to hold a referendum on independence while the Bosnian Serbs and Bosnian Croats formed autonomous territories. The FRY was suspended from a number of international institutions. This was due to the ongoing Yugoslav wars during the 1990s, which had prevented agreement being reached on the disposition of federal assets and liabilities, particularly the national debt. The Government of Yugoslavia supported Croatian and Bosnian Serbs in the wars from 1992 to 1995. Because of that, the country was under economic and political sanctions, which resulted in economic disaster that forced thousands of its young citizens to emigrate from the country. In a BBC documentary, called The Death of Yugoslavia, and later in his testimony before the International Criminal Tribunal for the former Yugoslavia during the trial of Slobodan Milošević, Yugoslav official Borisav Jović revealed that the Bosnian Serb army arose from the Yugoslav army forces in Bosnia and Herzegovina. He claimed that he had realized that Bosnia and Herzegovina was about to be recognized by the international community, and since Yugoslav People's Army troops were still located there at that point, their presence on Bosnian territory could have led to the Federal Republic of Yugoslavia being accused of aggression. To avoid this, he and Milošević decided to move all JNA soldiers originating from Serbia and Montenegro back into Serbia and Montenegro, and to move all JNA soldiers of Bosnian Serb descent to Bosnia and Herzegovina. In this way, every Bosnian Serb was transferred from the Yugoslav army to what became the newly created Bosnian Serb army. Through this, the Bosnian Serb army also received extensive military equipment and full funding from the FRY, as the Bosnian Serb faction alone could not pay for the costs. Furthermore, Serbian Radical Party founder and paramilitary Vojislav Šešelj claimed that President Milošević personally asked him to send paramilitaries into Bosnia and Herzegovina. In 1995, Serbian President Slobodan Milošević represented the FRY and Bosnian Serbs at peace talks in Dayton, Ohio, US, which negotiated the end of war in Bosnia with the Dayton Agreement. From 1996, the first public signs of political discord between parts of Montenegrin leadership and the Serbian leadership began to appear. By 1998, simultaneously with Montenegrin Prime Minister Milo Đukanović coming out on top in the power struggle with Montenegrin President Momir Bulatović, the republic undertook a different economic policy by adopting the Deutsche Mark as its currency. During autumn 1999, following the Kosovo War and the NATO bombing campaign, Đukanović (who by now firmly held power in Montenegro as Bulatović was completely squeezed out) drafted a document called Platforma za redefiniciju odnosa Crne Gore i Srbije (A platform for redefinition of relations within Montenegro and Serbia) calling for major changes in the division of governing responsibilities within FR Yugoslavia though still officially seeing Montenegro within a joint state with Serbia. Milošević did not respond to the platform, considering it unconstitutional. Political relations within the federal state became more and more strained, especially against the backdrop of the wave of assassinations against top figures from political, criminal, and state business circles in both republics (Željko "Arkan" Ražnatović, Pavle Bulatović, Žika Petrović, and Goran Žugić as well as two attempts on the life of opposition politician Vuk Drašković). By October 2000 Milošević had lost power in Serbia. Contrary to expectation, Đukanović's response to the power change in Belgrade was not to further push the agenda outlined in his platform, but instead to suddenly start pushing for full independence, thus completely dropping the platform in the process. Subsequent governments of Montenegro carried out pro-independence policies, and political tensions with Serbia simmered despite political changes in Belgrade. The Zašto? (Serbian Cyrillic: Зашто, "Why?") 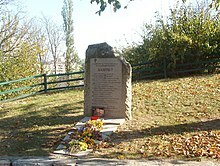 Monument, dedicated to the employees of the Radio Television of Serbia (RTS) who were killed during NATO bombing of the RTS building in 1999. With Milošević's second and last legal term as Serbian President expiring in 1997, he ran for, and was elected President of Yugoslavia in 1997. Upon taking office, Milošević gained direct control of the Yugoslav military and security forces, and directed them to engage Kosovo separatists. The conflict escalated from 1998 to 1999 and became known as the Kosovo War. Yugoslav forces committed a series of atrocities in Kosovo. To prevent ethnic cleansing, the North Atlantic Treaty Organization (NATO) under the leadership of the United States began an air campaign called Operation Allied Force against Yugoslav military forces and positions and suspected Serbian paramilitaries. The air attacks against Belgrade by NATO were the first attacks on the city since World War II. Some of the worst massacres against civilian Albanians by Serbian forces occurred after NATO started its bombing of Yugoslavia. The Serbian police and paramilitaries also committed massacres during the war, including the Cuska massacre and the Podujevo massacre. NATO promised to end its bombings of Yugoslavia, when Milošević agreed to withdraw all Yugoslav and Serb security forces from Kosovo. After an array of bombings, Milošević submitted and recalled all forces, and NATO peacekeepers entered Kosovo. In 2002, Serbia and Montenegro came to a new agreement regarding continued co-operation, which, among other changes, promised the end of the name Yugoslavia, since they were part of the Federal Republic of Yugoslavia. On 4 February 2003, the federal assembly of Yugoslavia created a loose state union or confederacy—the State Union of Serbia and Montenegro, although Yugoslavia was still commonly used. A new constitutional charter was agreed to provide a framework for the governance of the country. On Sunday, 21 May 2006, Montenegrins voted in an independence referendum, with 55.5% supporting independence. Fifty-five percent or more of affirmative votes were needed to dissolve the confederation and Yugoslavia. The turnout was 86.3% and 99.73% of the more than 477,000 votes cast were deemed valid. The subsequent Montenegrin proclamation of independence on June 2006 and the Serbian proclamation of independence on 5 June ended the confederation of Yugoslavia and thus the last remaining vestiges of the FR Yugoslavia. The Federal Assembly of the FRY (1992–2003) was composed of two chambers: the Council of Citizens and the Council of Republics. Whereas the Council of Citizens served as an ordinary assembly, representing the people of FRY, the Council of Republics was made equally by representatives from the federation's constituent republics, to ensure federal equality. The status of leadership of the FRY president was unstable with no president lasting more than four years in office. The first president from 1992 to 1993 was Dobrica Ćosić, a former communist Yugoslav partisan during World War II and later one of the fringe contributors of the controversial Memorandum of the Serbian Academy of Sciences and Arts. Despite being head of the country, Ćosić was forced out of office in 1993 due to his opposition to Serbian President Slobodan Milošević. Ćosić was replaced by Zoran Lilić who served from 1993 to 1997, and then followed by Milošević becoming Yugoslav President in 1997 after his last legal term as Serbian president ended in 1997. The presidential election in 2000 was accused of being the result of vote fraud. Yugoslav citizens took to the streets and engaged in riots in Belgrade demanding that Milošević be removed from power. Shortly afterwards Milošević resigned and Vojislav Koštunica took over as Yugoslav president and remained president until the state's reconstitution as the State Union of Serbia and Montenegro. Federal Prime Minister Milan Panić became frustrated with Milošević's domineering behaviour during diplomatic talks in 1992, and told Milošević to "shut up" because Milošević's position was officially subordinate to his position. Milošević later forced Panić to resign. However, this situation changed after 1997 when Milošević's second and last legal term as Serbian President ended. He then had himself elected Federal President, thus entrenching the power that he already de facto held. After the federation was reconstituted as a state union, the new Assembly of the State Union was created. It was unicameral and was made up of 126 deputies, of which 91 were from Serbia and 35 were from Montenegro. The Assembly convened in the building of the old Federal Assembly of FRY, which now houses the National Assembly of Serbia. In 2003, after the constitutional changes and creation of the State Union of Serbia and Montenegro, a new President of Serbia and Montenegro was elected. He was also president of the Council of Ministers of Serbia and Montenegro. Svetozar Marović was the first and last President of Serbia and Montenegro until its breakup in 2006. The Armed Forces of Serbia and Montenegro (Serbian: Војска Србије и Црне Горе/Vojska Srbije i Crne Gore; ВСЦГ/VSCG) included ground forces with internal and border troops, naval forces, air and air defense forces, and civil defense. Preceding the VSCG was the Armed Forces of Yugoslavia (1992–2003, Војска Југославије/Vojska Jugoslavije, ВЈ/VJ) from the remnants of the Yugoslav People's Army (JNA), the military of SFR Yugoslavia. Map of the territorial subdivisions of Serbia and Montenegro. The territorial organisation of the Republic of Serbia was regulated by the Law on Territorial Organisation and Local Self-Government, adopted in the Assembly of Serbia on 24 July 1991. Under the Law, the municipalities, cities and settlements make the bases of the territorial organization. Serbia was divided into 195 municipalities and 4 cities, which were the basic units of local autonomy. It had two autonomous provinces: Kosovo and Metohija in the south (with 30 municipalities), which was under the administration of UNMIK after 1999, and Vojvodina in the north (with 46 municipalities and 1 city). The territory between Kosovo and Vojvodina was called Central Serbia. Central Serbia was not an administrative division on its own and had no regional government of its own. In addition, there were four cities: Belgrade, Niš, Novi Sad and Kragujevac, each having an assembly and budget of its own. The cities comprised several municipalities, divided into "urban" (in the city proper) and "other" (suburban). Competences of cities and their municipalities were divided. Municipalities were gathered into districts, which are regional centres of state authority, but have no assemblies of their own; they present purely administrative divisions, and host various state institutions such as funds, office branches and courts. The Republic of Serbia was then and is still today divided into 29 districts (17 in Central Serbia, 7 in Vojvodina and 5 in Kosovo, which are now defunct), while the city of Belgrade presents a district of its own. Montenegro was divided into 21 municipalities. Serbia and Montenegro had an area of 102,350 square kilometres (39,518 sq mi), with 199 kilometres (124 mi) of coastline. The terrain of the two republics is extremely varied, with much of Serbia comprising plains and low hills (except in the more mountainous region of Kosovo and Metohija) and much of Montenegro consisting of high mountains. Serbia is entirely landlocked, with the coastline belonging to Montenegro. The climate is similarly varied. The north has a continental climate (cold winters and hot summers); the central region has a combination of a continental and Mediterranean climate; the southern region had an Adriatic climate along the coast, with inland regions experiencing hot, dry summers and autumns and relatively cold winters with heavy snowfall inland. Belgrade, with its population of 1,574,050, is the largest city in the two nations: and the only one of significant size. The country's other principal cities were Novi Sad, Niš, Kragujevac, Podgorica, Subotica, Pristina, and Prizren, each with populations of about 100,000–250,000 people. Serbia and Montenegro had more demographic variety than most other European countries. The three largest named nationalities were Serbs (62.3%), Albanians (16.6%) and Montenegrins (5%) according to the 1991 census. The country also had significant populations of Hungarians, Yugoslavs, Muslims (ethnic group), Roma, Croats, Bulgarians, Macedonians, Romanians, Vlachs and others (under 1%). Most of the ethnic diversity was situated in the provinces of Kosovo and Vojvodina, where smaller numbers of other minority groups could be found. The large Albanian population was chiefly concentrated in Kosovo, with smaller populations in the Preševo Valley, and in the Ulcinj municipality. The Muslims (Slavic Muslims, including Bosniaks) population lived mostly in the federal border region (mainly Novi Pazar in Serbia, and Rožaje in Montenegro). According to a 2004 estimate the State Union had 10,825,900 inhabitants. According to a July 2006 estimate, the State Union had 10,832,545 inhabitants. The state suffered significantly economically due to the breakup of Yugoslavia and mismanagement of the economy, and an extended period of economic sanctions. In the early 1990s, the FRY suffered from hyperinflation of the Yugoslav dinar. By the mid-1990s, the FRY had overcome the inflation. Further damage to Yugoslavia's infrastructure and industry caused by the Kosovo War left the economy only half the size it was in 1990. Since the ousting of former Federal Yugoslav President Slobodan Milošević in October 2000, the Democratic Opposition of Serbia (DOS) coalition government has implemented stabilization measures and embarked on an aggressive market reform program. After renewing its membership in the International Monetary Fund in December 2000, Yugoslavia continued to reintegrate with other world nations by rejoining the World Bank and the European Bank for Reconstruction and Development. The smaller republic of Montenegro severed its economy from federal control and from Serbia during the Milošević era. Afterwards, the two republics had separate central banks whilst Montenegro began to use different currencies – it first adopted the Deutsch mark, and continued to use it until the mark fell into disuse to be replaced by the euro. Serbia continued to use the Yugoslav Dinar, renaming it the Serbian dinar. The complexity of the FRY's political relationships, slow progress in privatisation, and stagnation in the European economy were detrimental to the economy. Arrangements with the IMF, especially requirements for fiscal discipline, were an important element in policy formation. Severe unemployment was a key political and economic problem. Corruption also presented a major problem, with a large black market and a high degree of criminal involvement in the formal economy. Serbia, and in particular the valley of the Morava is often described as "the crossroads between the East and the West" – one of the primary reasons for its turbulent history. The valley is by far the easiest land route from continental Europe to Greece and Asia Minor. Until the outbreak of the Yugoslav wars, the once named highway "Bratstvo i jedinstvo" (Brotherhood and Unity) running through Croatia, Serbia and the Republic of Macedonia was one of Europe's most important transport arteries. It gradually resumed this role as the security situation stabilized. Major international highways going through Serbia are E75 and E70. E763/E761 is the most important route connecting Serbia with Montenegro. The Danube, an important international waterway, flows through Serbia. The Port of Bar was the largest seaport located in Montenegro. After the formation of Serbia and Montenegro, the Yugoslav tricolour was to be replaced by a new compromise flag. Article 23 of the Law for the implementation of the Constitutional Charter stated that a law specifying the new flag was to be passed within 60 days of the first session of the new joint parliament. Among the flag proposals, the popular choice was a flag with a shade of blue in between the Serbian tricolour and the Montenegrin tricolour of 1993–2004. The colour shade Pantone 300C was perceived as the best choice. However the parliament failed to vote on the proposal within the legal time-frame and the flag was not adopted. In 2004, Montenegro adopted a radically different flag, as its independence-leaning government sought to distance itself from Serbia. Proposals for a compromise flag were dropped after this and the Union of Serbia and Montenegro never adopted a flag. A similar fate befell the country's state anthem and coat-of-arms to be; the above-mentioned Article 23 also stipulated that a law determining the State Union's flag and anthem was to be passed by the end of 2003. The official proposal for a state anthem was a combination piece consisting of one verse of the former (now current) Serbian national anthem "Bože pravde" followed by a verse of the Montenegrin folk song, "Oj, svijetla majska zoro". This proposal was dropped after some public opposition, notably by Serbian Patriarch Pavle. Another legal deadline passed and no state anthem was adopted. Serious proposals for the coat of arms were never put forward, probably because the coat of arms of the FRY, adopted in 1994 combining Serbian and Montenegrin heraldic elements, was considered adequate. Thus, the State Union never officially adopted state symbols and continued to use the flag and national anthem of the Federal Republic of Yugoslavia by inertia until its dissolution in 2006. FR Yugoslavia, later Serbia and Montenegro, was considered by FIFA and UEFA to be the only successor-state of Yugoslavia. Football was experiencing major success during the 1980s and early 1990s, however due to the imposed economic sanctions, the country was excluded from all international competitions between 1992 and 1996. After the sanctions were lifted, the national team qualified for two FIFA World Cups—in 1998 as FR Yugoslavia and in 2006 as Serbia and Montenegro. It also qualified for Euro 2000. The 1998 World Cup appearance in France was accompanied with plenty of expectation and quiet confidence as the team was considered to be one of the tournament's dark horses due to being stacked with proven world-class players such as 29-year-old Predrag Mijatović, 33-year-old Dragan Stojković, 29-year-old Siniša Mihajlović, 28-year-old Vladimir Jugović, and 31-year-old Dejan Savićević, as well as emerging 19-year-old youngster Dejan Stanković, and tall 24-year-old target forwards Savo Milošević and Darko Kovačević. Another reason for heightened expectations was the fact this was the country's first major international appearance following the UN-imposed exile. However, the talented squad never managed to hit top gear—although it did make it out of the group, it got eliminated by the Netherlands via an injury-time goal in the round-of-16. Two years later at Euro 2000, virtually the same team again made it out of the group and was again eliminated out of the tournament by the Netherlands, this time convincingly 1–6 in the quarter finals. The country was also represented at the 1996 Summer Olympic Games, the 2000 Summer Olympic Games, and the 2004 Summer Olympic Games. Serbia and Montenegro were represented by a single national team in the 2006 FIFA World Cup tournament, despite having formally split just weeks prior to its start. The final squad was made up of players born in both Serbia and Montenegro. They played their last ever international on 21 June 2006, a 3–2 loss to Ivory Coast. Following the World Cup, this team has been inherited by Serbia, while a new one was to be organized to represent Montenegro in future international competitions. The men's basketball team dominated European and world basketball during the mid-to-late 1990s and early 2000s with three European titles, two World Championships titles (1998 and 2002), and the Olympic silver medal. The national team started competing internationally in 1995 after a three-year exile due to a UN trade embargo. During this time, FR Yugoslavia was not allowed to compete at the 1992 Summer Olympics in Barcelona, Eurobasket 1993, and finally 1994 FIBA World Championship whose hosting was originally awarded to Belgrade before being taken away and moved to Toronto, Canada. At the Eurobasket 1995 in Athens, its first international competition, the hungry and highly motivated Yugoslav team led by Dušan Ivković brought a starting five full of world-class talent with established European stars at positions one through four — 27-year-old Saša Đorđević, 25-year-old Predrag Danilović, 29-year-old Žarko Paspalj, 22-year-old Dejan Bodiroga — capped off with 27-year-old Vlade Divac, the starting center for the LA Lakers at the five position. With the bench that was just as capable — experienced Zoran Sretenović (the only player over 30 in the team), Saša Obradović, talismanic power forward Zoran Savić, and up-and-coming young center Željko Rebrača — the team rampaged through its preliminary group featuring medal contenders Greece and Lithuania with a 6–0 record. At the first direct elimination stage, the quarterfinals, Yugoslavia scored 104 points to destroy France, thus setting up a semifinal clash with hosts Greece. In the highly charged atmosphere of the OAKA Arena, Yugoslav team demonstrated its versatility, using defensive prowess this time to pull off a famous eight-point win in a tense, low-scoring 60–52 game. The final against experienced Lithuania team led by basketball legend Arvydas Sabonis in addition to world class players Šarūnas Marčiulionis, Rimas Kurtinaitis, Valdemaras Chomičius, etc., turned into a classic game of basketball with crafty Yugoslavs prevailing 96–90 behind Đorđević's 41 points. They were represented by a single team in the 2006 FIBA World Championship as well, even if the tournament was played in mid/late-August and early-September that year and the Serbia–Montenegro breakup had occurred in May. This team was also inherited by Serbia after the tournament, while Montenegro created a separate national basketball team afterwards, as well as the national teams of all other team sports. Serbia and Montenegro was represented in the Miss Earth 2006 pageant by a single delegate, Dubravka Skoric. Serbia and Montenegro also participated in the Eurovision Song Contest and in Junior Eurovision Song Contest 2005 only on one occasion. The country debuted in the Eurovision Song Contest under the name Serbia and Montenegro in 2004, when Željko Joksimović got 2nd place. The next to follow was the Montenegrin boyband No Name. In 2006, the year of Montenegrin independence, the country Serbia and Montenegro did not have a representative due to the scandal in Evropesma 2006. ^ Price, Matthew (5 June 2006). "Profile: Serbia and Montenegro". BBC News. ^ "Participation of Former Yugoslav States in the United Nations". Max Planck Yearbook of United Nations Law (PDF). pp. 241–243. Archived from the original (PDF) on 13 June 2010. ^ "FR Yugoslavia Investment Profile 2001" (PDF). EBRD Country Promotion Programme. p. 3. Archived from the original (PDF) on 28 September 2011. wrongly gives the date as 2 November 2000. UN General Assembly Resolution 55/12 was passed and FRY took its seat on 1 November 2000. ^ "Serbia and Montenegro". The World Factbook 1999. Virginia: Central Intelligence Agency. 16 August 2000. ^ Sabrina P. Ramet. Serbia Since 1989: Politics and Society Under Milošević and After. University of Washington Press, 2005. pp. 55–56. ^ a b c Steven L. Burg, Paul S. Shoup. The War in Bosnia-Herzegovina: Ethnic Conflict and International Intervention. Armonk, New York, USA: M.E. Sharpe, 2000. ISBN 9781563243097 pp. 72–73. ^ a b c "Bosnia: Who Lit the Fire?". YouTube. 11 November 2007. Retrieved 26 August 2010. ^ "Justice for Kosovo – Massacre at Cuska". Americanradioworks.publicradio.org. Retrieved 26 August 2010. ^ "CBC News Indepth: Balkans". CBC News. ^ "Inside Kosovo – Velika Krusa". BBC News. ^ Solana, Javier. "NATO's Success in Kosovo". Foreign Affairs. 78 (6). doi:10.2307/20049537. ^ James Gow. Triumph of the Lack of Will: International Diplomacy and the Yugoslav War, Columbia University Press (1997). New York City. p. 228. ^ Sabrina P. Ramet. Serbia Since 1989: Politics and Society Under Milošević and After. University of Washington Press, 2005. p. 61. ^ Price, Matthew (7 October 2003). "Belgrade flag flap reveals identity crisis". BBC News. Retrieved 26 August 2010. ^ "Nova drzavna himna: Boze zore". Vreme. Retrieved 26 August 2010.